From the 11th to the 19th October. The African Film Festival of Cordoba, 10 years breaking stereotypes. 66 films by 31 different countries in the programme, along with parallel activities, exhibitions and a space for professionals. 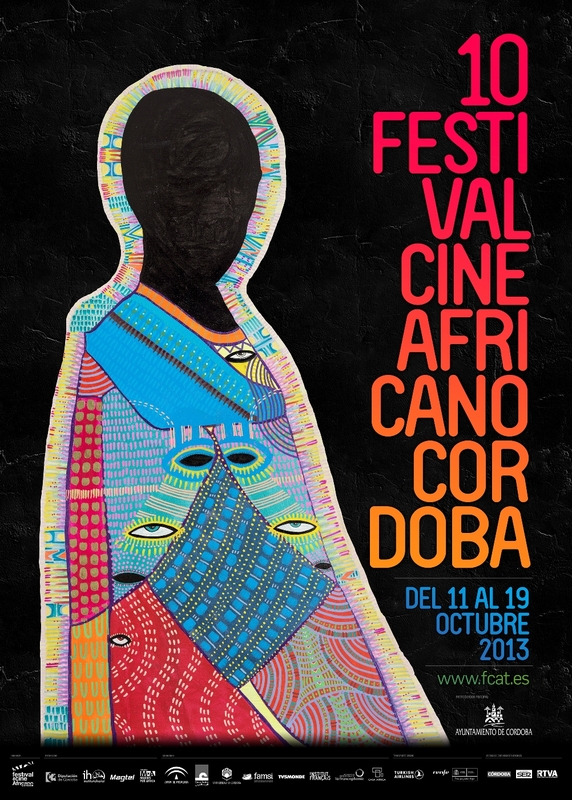 The African Film Festival of Cordoba-FCAT returns from the 11th to the 19th of October in order to celebrate its 10th anniversary, striving for the contribution to a better understanding of the neighbouring continent through its film culture. In this tenth edition – the second one in Cordoba after eight years in Tarifa (Cadiz) –, Cordoba cements its place as the only Spanish platform showcasing African and Middle Eastern cinemas. FCAT Cordoba, organised by the NGOD Al Tarab with the sponsorship of the City Council of Cordoba, Magtel Corp. and Instituto Halal, will screen during one week over 66 films from or on Africa made by 31 different countries. This will be completed by a series of activities for all audiences and professionals, spread across the city. The mayor of Cordoba, José Antonio Nieto, has highlighted in the press conference that the FCAT Cordoba “is not a festival seeking for glamour, the yellow press or the big stars”. Instead it aims at “reinforcing the relation between the city of Cordoba and Africa, which is very close geographically speaking but very far away in our mind and heart”. “Sometimes”, he has added, “it is a good idea to be directly exposed to Africa in order to better understand”, and this is possible through a festival like this. Organising this event has been quite hard, however, it presents even more quality than the last edition, which already engaged an audience composed of over 13,000 spectators. “This festival places Cordoba at the centre of the world of African and Arab cinema”. Mane Cisneros, Director of the festival, has anticipated that there will be a strong presence of North African young filmmakers, “who have already had the time to take into perspective what has been going on in this area”, in relation to the so-called ‘Arab Spring’. She has also insisted on the high number of premiers at the festival, since “fortunately or unfortunately, we keep struggling to convince Spanish distributors that these cinemas can have a commercial release in our country”. For the celebration of its tenth anniversary, the African Film Festival of Cordoba has organised a special retrospective film category. It works as a review of over fifty years of African cinemas, consisting on a selection of 10 films revolving about love. The category, named ’10 Fragments of an African Discourse on Love” is not just an anthropological analysis on love practices and desire manifestations in Africa, but also, a whole statement of intentions by the FCAT organisation. This is the year for the 10th anniversary since a collective of people shared their love for African cinemas under the shape of a film festival, becoming a unique initiative in Spain. The festival programme is divided into eight sections, being three of them competitive. The three competitive categories, The African Dream (feature length films), On the Other Side of the Strait (documentary films) and Africa in Short (feature and documentary short films) will include a total number of 27 titles. In addition to this, the non-competitive categories are Pandora’s Box (films on Africa made by Western filmmakers), Africa in Rhythm (on African dance and music), Carte Blanche to the EDOC (taking as to the International Festival of Documentary Film of Quito through a selection of five films on afrodescendants) and the already mentioned 10 Fragments of an African Discourse on Love. Finally, there will be a series of special sessions to be added to these two official and non-official selections. The 10th African Film Festival of Cordoba will bring to the cinemas of the capital a selective show comprising 31 different countries. It is worth mentioning the strong participation of North African titles, made in Algeria, Egypt, Morocco, Mauritania and Tunisia; as well as that of sub-Saharan titles, with film productions from Senegal, Burkina Faso, Cameroon, Nigeria and South Africa, one of the most established film industries in the continent. Similarly there will be non African countries represented, including, Germany, Angola, Saudi Arabia, Brazil, Canada, Colombia, Ecuador, Spain, United States, Ethiopia, France, Gabon, Guinea Conakry, Equatorial Guinea, Kenya, Madagascar, Mozambique, Portugal, Qatar, Dem. Rep. Congo, Trinidad and Tobago. One again, FCAT Espacio Profesional is aimed at the promotion of mutual knowledge and the collaboration among the professionals of this field in Africa, Spain and beyond. The professionals involved will meet from the 15th to the 18th October at Casa Árabe, during the 5th Forum ‘África Produce’ and a series of conferences and round tables. An additional element to be considered is the Film Appetizers, a more informal environment of discussion among filmmakers, journalists, audiences, and thus a great opportunity to discuss in-depth the films included in the competitive categories of the festival. Among the parallel activities at FCAT, a special mention lies on the organisation of the course-workshop on Film Criticism for young professionals. This workshop offers an introduction to the theory and practice of Film Criticism and Cultural Communications, and is conducted by the acclaimed film reviewer Alfonso Crespo, with invited experts as tutors, such as Beatriz Leal Riesco and Olivier Barlet, among others. FCAT Cordoba is not just about the venues for the screening of films, as the wide range of parallel activities shows. There will be a story-teller during the afternoons, screenings in different municipalities, a photography exhibition by Javier Hirschfeld called Malagorée: de puerto a puerto. Arte malagueño de ida y vuelta [Malagorée: from port to port. Art from Málaga to go and return], and meetings with different NGOs in the city. An innovative aspect of this edition, if the involvement of the volunteering team, composed of eighty people. They have been organising activities prior to the festival, such as the educational sessions, the screening of a video made by them in the centre of under-eighteen people and the meeting of volunteers with entrepreneurs. The venues where the festival will take place are Teatro Góngora, Casa Áraba, Vimcorsa, the cultural centre Rey Heredia Veintidós and Instituto Andaluz de la Juventud (Andalusian Youth Institute). This year, the tickets to the screenings can be purchased at the tickets box office of the different venues, which will open to the audience one hour prior to the screening. Additionally, there will be three kinds of ticket deals – one-day pass, festival pass, and discounted pass for students, unemployed and people aged over 65. All passes will be available for sale at the tickets box office of Teatro Góngora. The festival pass will also be available for sale at Fuentes Guerra.